"Be Bold and Seek Adventure" is the motto of traveling wedding photographers Liz and Mike of Finny Hill Photography. 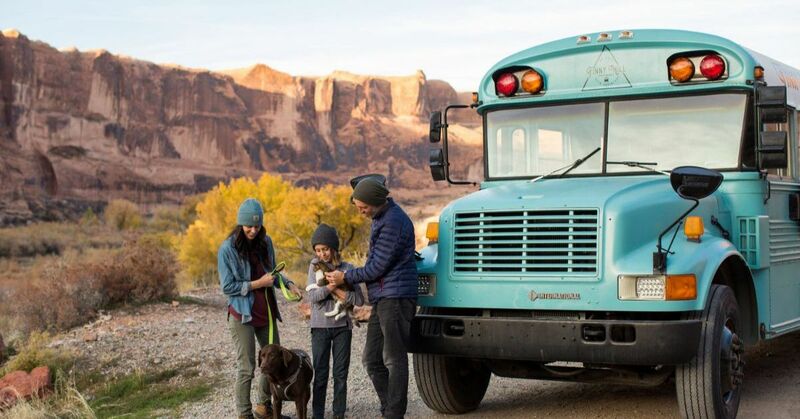 The couple lives full time in their renovated Skoolie with their son and chocolate lab, hitting the road to capture intimate weddings and elopements. The family stays at state parks, campgrounds and RV parks along the way, truly living off the grid in 175 square feet. The cheery turquoise exterior leads to a bright and welcoming home within. Off of the entry, twin closets offer storage space and sleek wood paneling. The ceiling is painted in a clean white shell. Windows lined with vintage sconces flank the bus for ample light and openness. A tribal runner lines the gray wood flooring. A roomy couch is positioned across from the dual-purpose dining and working area. Vintage velvet upholstered chairs complete the well-traveled aesthetic. A gallery wall above the seating area transitions to the kitchen and sleeping loft beyond. More natural wood paneling offers a cozy cabin vibe. The kitchen is finished with sleek wooden countertops and an antique bronze faucet above a small copper basin sink. Curtains under the cabinets conceal storage space and plumbing. Across from the kitchen, the dining table serves as a place for home school lessons on the road. At the back of the bus, the bedroom is separated by barn doors for style and privacy. A statement wall is clad in swan wallpaper, in front of more storage space. The couple decided not to build a shower, relying on RV parks and campgrounds, but is planning renovations for 2019.